WE WERE THE FIRST COMPRESSION MOLDERS OF PTFE. 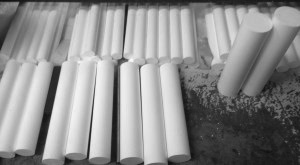 4B Plastics was the first “Compression Molders” of Polytetrafluoroethylene (PTFE) with full custom manufacturing and machining facilities in the Southeastern United States. 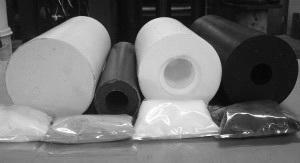 If you want quality finished parts, you have to start with quality stock materials. By molding our own PTFE stock in house, 4B Plastics is able to maintain strict quality control from molded billet stock to the finished part. Compression molding is a 3-step process. First, a specified amount of PTFE resin is loaded into a steel cylindrical mold. Next the resin is compressed under hydraulic air pressure for a specified time according to the recipe. The preformed billet is then stripped from the mold and placed into a forced air oven for the final step called sintering. After the sintering process is complete the PTFE billet is ready to be machined. AND DISCOVER THE 4B ADVANTAGE.